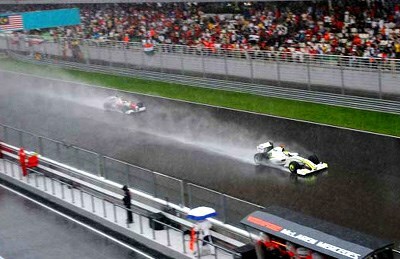 GP Wrap: Brawn, Williams and Toyota bring home a monsoonal Malaysian GP in Sepang. Bernie Ecclestone really didn't think this one through. The F1 promoter could hardly hold off the monsoon season in Sepang, where late afternoon downpours of torrential proportions are not simply forecast, but guaranteed. The Malaysian Grand Prix was stopped after just 31 laps, less than half of its scheduled race time, as the late race start (so the Euro watchers didn't miss the action) planted the race right in the middle of the late afternoon storms. Under ominous clouds, Nico Rosberg led the race from fourth place, moving up the inside past an oversteering Brawn GP pole-sitter Button and thwarting the possibility of another Brawn front line. But Button had a heavier fuel load, and as the leaders pulled away to pit, he remained on the 5.5km Sepang circuit and ultimately came out of his scheduled fuel pitstop in first place with a new set of fresh soft tyres. From lap 20 the rain began to fall, though not early enough for Ferrari's Raikkonen who gambled and pre-empted the downpour with full wets - which disintegrated on the still-dry track. Toyota changed to intermediates and helped Timo Glock to cut through the field, until the whole field was on full wets by lap 30. The red flags were out shortly afterwards, and the standings taken back to lap 31 - Button from Nick Heidfeld and Glock. Aussie Mark Webber finished well in sixth, just in front of last year's champ Lewis Hamilton. But the race was not officially declared for almost an hour as the officials - already under fire for Lewis Hamilton's AGP disqualifying drama, below - delayed the decision as the rain continued to pour. Only half points were awarded for the truncated race. Button leads the driver's championship with 15 points, then Barrichello on 10, Trulli on eight and a half, Glock on eight and Alonso on four points (as Hamilton was stripped of third and points by the stewards for misleading information regarding a pass under yellow at the AGP).